Hallie & Geoff were planning their California wine country wedding when the horrible wildfires changed their plans. Napa was no longer an option for their December wedding. 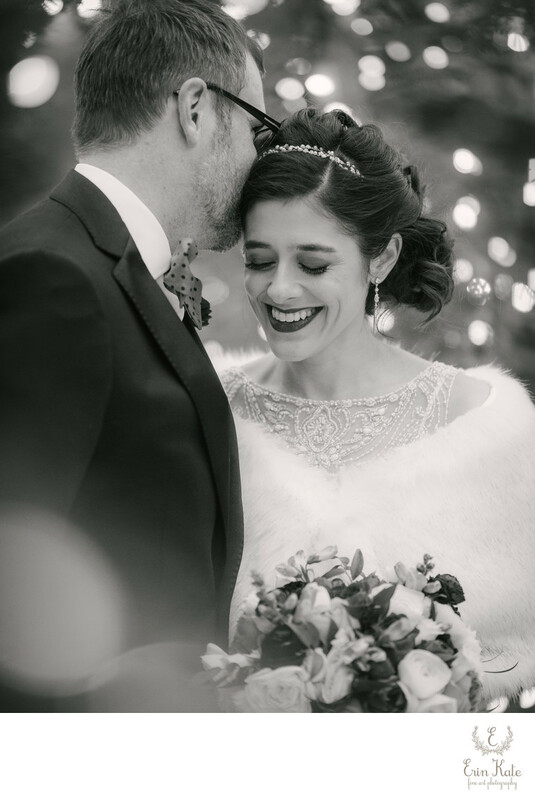 They live in Texas and knew they wanted a destination wedding so they changed plans completely and decided on a winter wonderland wedding at the Stein Eriksen Lodge in Deer Valley. Hallie & Geoff did not want to see each other before they were officially husband and wife but they were having a candlelit evening ceremony. In the end, they decided on a first look to take advantage of the amazing mountain scape during the daylight hours. I'm sure glad they did because the mountain views were stunning, trees were all lit up for the holidays, and snowflakes were falling. If they had not taken advantage of this time they would not have any images of the two of them in the mountains of Park City! I love this image of the two of them. We walked down to the entrance of Stein Eriksen to photograph them in the pine trees. These trees were filled with holiday lights and set in front of an amazing view of Deer Valley. This black and white image has lovely contrast with his dark suit and her white faux fur wrap. Location: 7700 Stein Way, Park City, UT 84060.